The weekly Torah portion (Hebrew: פָּרָשַׁת הַשָּׁבוּעַ‎ Parashat ha-Shavua, popularly just parashah or parshah /pɑːrʃə/ or parsha and also known as a Sidra or Sedra /sɛdrə/ is a section of the Torah (Hebrew Bible). It is read publicly and aloud by a designated reader (ba'al koreh) in Jewish prayer services, usually in full during the Shabbat (Saturday, the Jewish Sabbath) morning service and in part during the Shabbat afternoon and Monday and Thursday morning services, except when pre-empted by a religious holiday. There are 54 such parashiyot (plural) or parshahs (anglicized pluralization) in Judaism, and the full cycle is read over the course of one Jewish year. Each weekly Torah portion takes its name from the first most distinct word in the Hebrew text of the portion in question, often from the first verse. 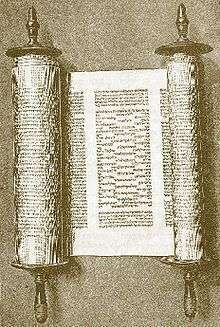 Dating back to the time of the Babylonian captivity (6th century BCE), public Torah reading mostly followed an annual cycle beginning and ending on the Jewish holiday of Simchat Torah, with the divisions corresponding to the lunisolar Hebrew calendar, which contains up to 55 weeks, the exact number varying between leap years and regular years. ↑ One week is always Passover and another is always Sukkot, and the final parashah, V'Zot HaBerachah, is always read on Simchat Torah. Therefore, there are in practice up to 53 available weeks for 53 portions. In years with fewer than 53 available weeks, some readings are combined to achieve the needed number of weekly readings.